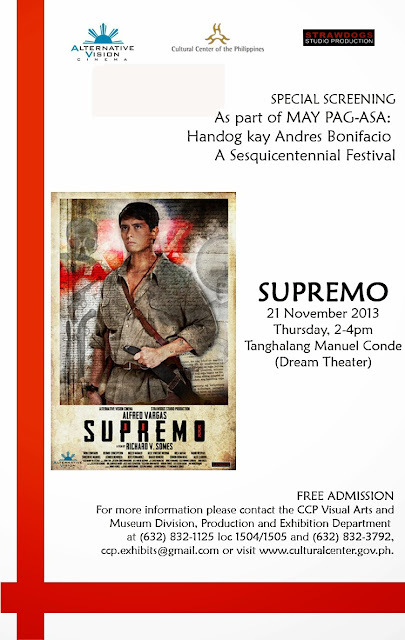 The Cultural Center of the Philippines invites you to the special screening of the film SUPREMO. It will be held on November 21, 2013 (Thursday) from 2-4pm at the Dream Theater. This screening is a part of the MAY PAG-ASA: Handog kay Andres Bonifacio Sesquicentennial Festival of the CCP. SUPREMO is a feature film produced by its lead star Alfred Vargas, together with his brother Patrick Michael. The film recounts the life of Bonifacio before the founding of the Katipunan, his relationship with his wife Gregoria de Jesus, and the battle he was involved with. Directed by Richard Somes, it features Jiro Manio as Emilio Aguinaldo, Hermie Concepcion as Tandang Sora, Nica Nava as Gregoria de Jesus, Nicco Manalo as Emilio Jacinto, Alex Medina as Procopio Bonifacio, and Mon Confiado as Andres' best friend, Macario Sakay. This screening is free of charge but registration is requested via ccp.exhibits@gmail.com. For more information, contact the CCP Visual Arts and Museum Division, Production and Exhibition Department at (632) 832-1125 loc 1504/1505 and (632) 832-3792, mobile (63920) 4700690 or visit www.culturalcenter.gov.ph.